High-intensity exercise results in reduced substrate levels and accumulation of metabolites in the skeletal muscle. The accumulation of these metabolites (e.g. ADP, Pi and H+) can have deleterious effects on skeletal muscle function and force generation, thus contributing to fatigue. Clearly this is a challenge to sport and exercise performance and, as such, any intervention capable of reducing the negative impact of these metabolites would be of use. Carnosine (β-alanyl-l-histidine) is a cytoplasmic dipeptide found in high concentrations in the skeletal muscle of both vertebrates and non-vertebrates and is formed by bonding histidine and β-alanine in a reaction catalysed by carnosine synthase. Due to the pKa of its imidazole ring (6.83) and its location within skeletal muscle, carnosine has a key role to play in intracellular pH buffering over the physiological pH range, although other physiological roles for carnosine have also been suggested. The concentration of histidine in muscle and plasma is high relative to its K m with muscle carnosine synthase, whereas β-alanine exists in low concentration in muscle and has a higher K m with muscle carnosine synthase, which indicates that it is the availability of β-alanine that is limiting to the synthesis of carnosine in skeletal muscle. Thus, the elevation of muscle carnosine concentrations through the dietary intake of carnosine, or chemically related dipeptides that release β-alanine on absorption, or supplementation with β-alanine directly could provide a method of increasing intracellular buffering capacity during exercise, which could provide a means of increasing high-intensity exercise capacity and performance. 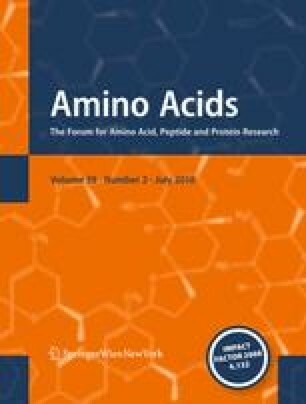 This paper reviews the available evidence relating to the effects of β-alanine supplementation on muscle carnosine synthesis and the subsequent effects on exercise performance. In addition, the effects of training, with or without β-alanine supplementation, on muscle carnosine concentrations are also reviewed.